Loreto is undoubtedly one of the major pilgrimage sites in the world. Every year, millions of pilgrims from all over the world come to this city to visit one of the most important places for the Christian tradition: the Shrine of the Holy House of Loreto. According to the legend, during the invasion of Palestine by the Seljuk Turks in 1291, the angels lifted the small house of Jesus and from Nazareth they took it flying up to the top of a hill covered with laurels: it is just in this land that Lauretum (laurus from Latin) will born and it will become the current town. Enter the Basilica and visit the house where the Virgin Mary received the Annunciation is an experience that takes you back in time, making you breathe a spirituality and a unique peace. Inside the Holy House it is safely guarded the famous “Black Madonna”, the patron of the aviators and dear to the sailors. This magical place manages to surprise and excite with its charming atmosphere even the non-believers. 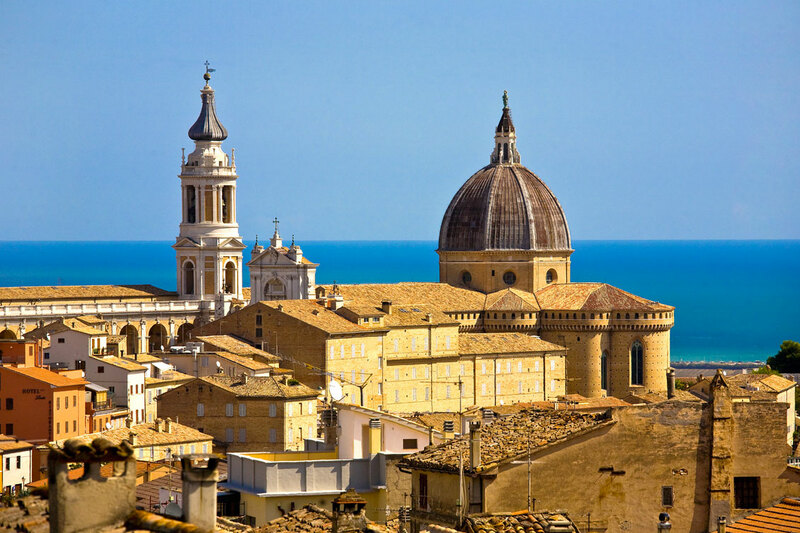 Loreto is located on the top of a hill from which you can enjoy a wonderful view: the colours of the countryside are mixed with those of the sea. It is not uncommon on a winter day to admire the sea having behind the snowy peaks of the Monti Sibillini. This magical place can be reached easily from Ancona in less than half an hour’s drive.